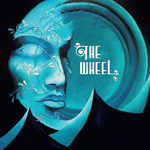 The Wheel, from Norway, are reinventing classic heavy rock for the 21st century. Their sound is steeped in the heavy riffage and bottom end, with a nod to the blues, of the Seventies. You might hear some Led Zeppelin or Free in their tones. This is basically no nonsense hard rock. Unfortunately, it's not a persuasive as it could be. It was difficult to find a song that was wholly engaging or rose above the rest. With little doubt The Wheel know there classic rock roots, as they are fine musicians and sound songwriters, but I'm not sure they've made it accessible to listener. Yet, having said that, The Wheel might grow on you, especially listening to the groove and blues of Lost Souls or the heavy and catchy rock of Cry On the Night. And you may hear a whisper of Zeppelin in Love. The final and longest track, All the Time, shows more versatility and the band's inherent musical strength. The Wheel is certainly an album that demands more than a single spin to appreciated. Yet, after two or three, I found myself interested, but still unconvinced. It's a shame, really, as I'm not likely to give The Wheel another roll to change my ambivalence. The Wheel is certainly an album that demands more than a single spin to appreciated. Yet, after two or three, I found myself interested, but still unconvinced of their Seventies heavy rock resurrection.